to rate this auction ! Amazing M- condition RARE original UK issue from 1965 of this BERZERK double-sider. Has got Jimmy Page on guitar. 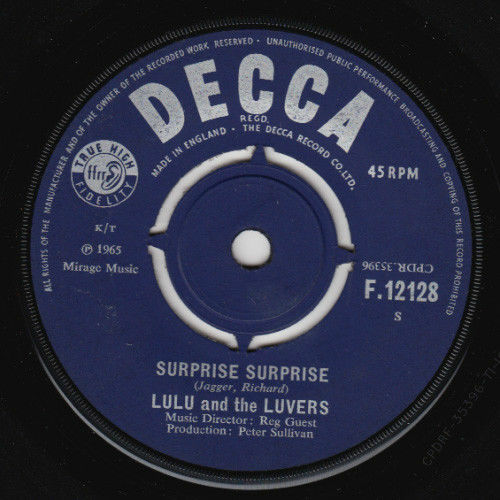 The version of Rolling Stones "Surprise Surprise" is an absolute BLASTER. Have a listen below! Great flipside as well. Seldom turns up in this beautiful condition! Don't forget to check out my other auctions this week. 1-3 45s: $5 to Sweden. $8 to USA, Europe & rest of the world. 4-8 45s: $7 to Sweden. $12 to USA, Europe & rest of the world. 1 LP/12": $8 to Sweden. $14 to USA, Europe & rest of the world. 2-3 LP/12"s: $9 to Sweden. $20 to USA, Europe & rest of the world. 4-6 LP/12"s: $11 to Sweden, $26 to USA, Europe & rest of the world. IMPORTANT! Payment shall be recieved within 10 days. PLEASE NOTE! In the unlikely event that it might happen, I can not be held responsible for packages going missing unless you've asked to have them sent with insured/registered shipping. Payment is accepted via PayPal.